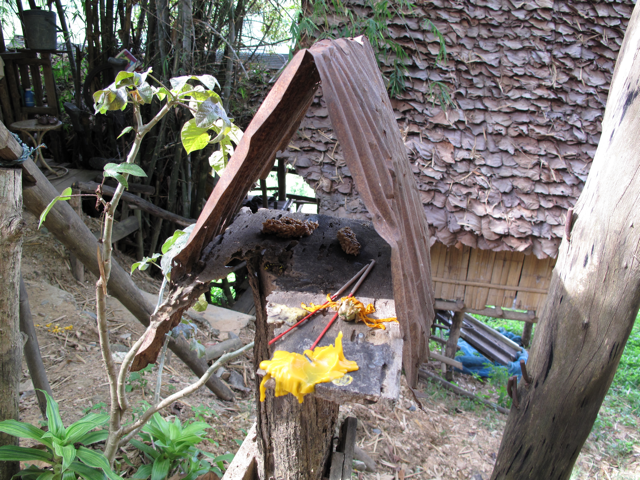 Since I arrived in Thailand, I was intrigued by seeing all of those little spirit houses. They're pretty much everywhere, especially near human dwellings such as houses and businesses. They offer a nice place for the phra phum ("the spirit of the house") to stay so that it can bring good fortune on one's property. According to what I have come to learn by asking around me, people in Thailand believe in animist spirits. Pretty much everything seems to have a spirit attached to it, such as trees and rivers. Those spirits, called phi in Thai, can have different tempers. Ong told me the other day that a fortune teller came to ComPeung once and told himthat one an old Tamarind tree near ComPeung holds a very powerful demon and that a proper spirit house should be built for it. 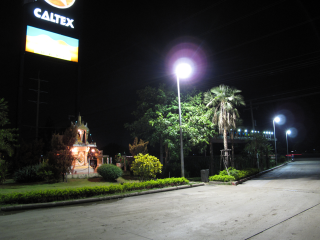 When one builds a new building in Thailand, he should get a specialist to tell him the precise location where the spirit house should be built. On a specific date, a ceremony is held, the spirit house is blessed by monks and some offerings are given so as to let the spirits of the place move to their new house (see video below of such a ceremony, found on YouTube). Whenever one upgrades his house, he must be sure to upgrade the spirits house as well, otherwise his luck might fail. It is said that a stranger who enters a house first need to ask for permission to the spirits before coming, otherwise he might have trouble sleeping. Ong told me this story yesterday that once, he didn't ask for the permission to stay in a guesthouse and that the spirits of the wood came tormented his sleep. I'm fascinated by all this. I believe it would be great to play with that, maybe trying to interact with the spirits, allowing them to manifest through the work. 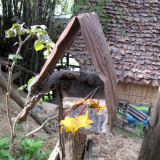 What is a Thai spirit house?